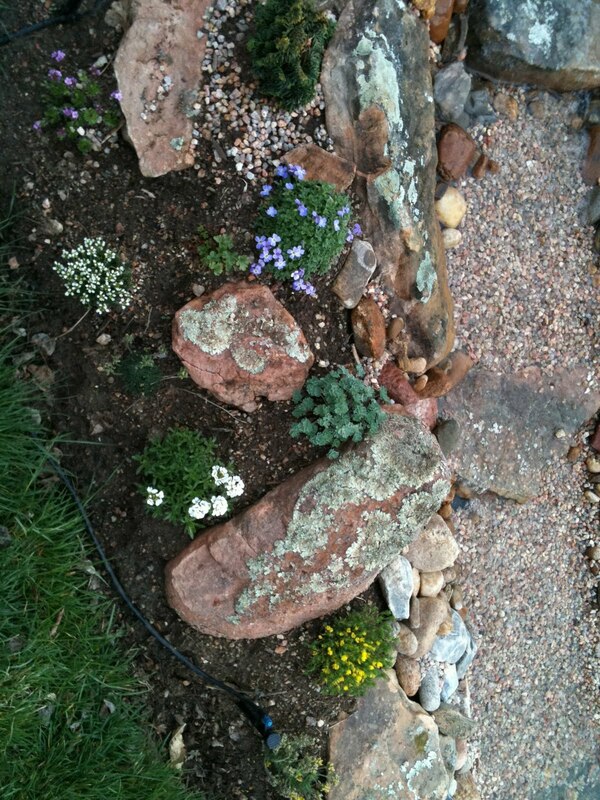 So back to the rock garden. It took me a while to finalize the rocks in and around the waterfall and place the pea gravel and get the minor leaks/run-over issues I had. Once that was completed I purchased a couple of water plants-as the actual pond is small-a water lily and an iris. I then went to my favorite speciality rock garden nursery. They are a wholesale grower that attends the Denver Botanic Garden plant sale-by the way it is next week May 6th-they are open by appointment only and sell to some of the retail centers and the mail order catalog High Country Gardens. It is wonderful having such a great little nursery in my neck of the woods. Actually, it is my parent's neck of the woods. So I usually make it a weekend trip with my two boys to visit my parent's and my sister and the nursery. I purchased quite a few plants this trip and returned home and started planting. I also ordered four plants from a fabulous nursery that has a wonderful online store and website called Two Green Thumbs. I ordered 4 miniature trees from her last fall. I have an order waiting for me for 4 more miniature trees. They are wonderful and absolutely fabulous little plants. I instantly loved them. She has such high quality items. I planted till my heart was content. Although, I can tell you it is still a fairly large area to plant and I am in need of about $200.00 worth of plants. Thee miniature trees are part of this. I think the scree bed is good for now, but could add a couple more items to this bed to fill it in. How do I afford all of this? I also need to add some to the shade garden and have a new garden to start. Anyways, I digress again. I mulched the little trees in with pea gravel and left the other plants without pea gravel mulch awaiting the next batch of plants for more completion prior to putting the pea gravel down. The other slight issue I have is some of the grades are rather steep and the pea gravel will do a lot of sliding - something I did not fully consider in my design. All of these things I learn as I go. So I will work on this issue as we move forward and the plants get larger. Overall, I am very happy with the results. Late last fall I made some chicken wire and burlap wire cages. I cut 8-10" strips of chicken wire and burlap to match and zip tied them together at the ends-creating a circle. I then used bamboo stakes threaded through the chicken wire/burlap to install them into the ground around each of my small miniature trees as some of them are prone to our dry winters causing desiccation. I covered the rest of the waterfall plants with just burlap. The burlap also aided in keep a large amount of leaves out of the rocks-makes it difficult to clean it out in the spring with all of those leaves in it. I couple of weeks ago it was time to unwrap it and it seriously like Christmas. I was so excited. I had early spring bloomers reaching for their time in the sun. The miniature pusch norway spruce I planted was starting to elongate it's new spring growth. Some of the flower colors were amazing and so vibrant in these little plants. It is such a joy to watch it grow. I had some plants in the scree bed that I over-wintered there that I transplanted earlier this week into the waterfall area. I have attached a timer to the waterfall pump and it comes on at 6am and goes off at 8pm. It is such a pleasure to get up in the morning and look out my window. Then I check on everybody before I leave for work. Just to see if there is something new to see. In the summertime when we have the windows open (we don't have AC) I leave the waterfall running for a bit longer in the evening so we can enjoy the trickling waters as we lay in bed.